Clinton Elementary (K-3), Northwest Local Schools of Clinton, OH. The next session we had we BRAINSTORMED all the different kind of faces that one could make (clown, alien, etc...). From then on each child got two pieces of drawing paper to make two very different faces on (one face per page). They colored them using markers and crayons. When these faces were complete they received a large 11 x 18 (28 x 46 cm) piece of paper. On this page they were to cut out the pieces and parts of the two different faces that they had created and were to glue them down to make a new Picasso face! They could mix and match and then add any details they wanted, but they were to be creative and silly. The children loved the results and I did too! 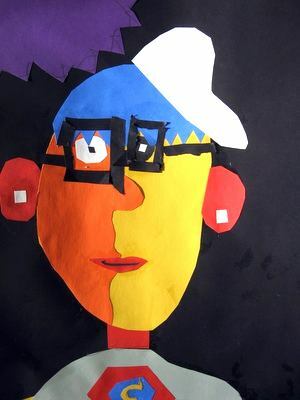 Brooklyn Elementary Art Room's Picasso face lesson. Arts For Life also has a Picasso lesson. The David Luben Art Studio also has a lesson called "Complimentary Picasso inspired Profiles." Picasso (Getting to Know the World's Greatest Artists) - This well known book series covers a simple biography of Picasso and some of his work. Who Was Pablo Picasso? - True Kelley’s biography is a wonderful introduction to modern art. Ages 9 - 12. Pablo Picasso Print of The Weeping Woman - This poster has a very interesting face for students to see and discuss.